Another playful character the grade 1 students are making is their own doll. They have created their unique little friend with fabric, wire, yarn, ribbons, fur, card, pipe cleaners and love. 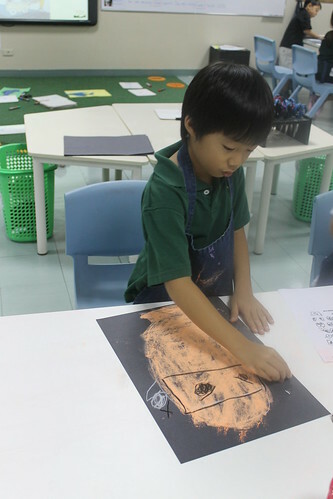 Our unit on Reading Art unit has been easy to link to the homeroom unit of Creative Expression, in which the students have been learning how to be creative through play. Creating characters from fish, monsters and cartoons has helped us to understand how to create and read feelings and emotions in art. From this we have begun to develop our own characters that can be used as part of our creative and imaginative play. The first of these characters was an animal made from clay. Students first learnt how to roll, shape and connect the clay using slip and score techniques. Once they where familiar with the techniques they were able to create their own animal characters. They went into the hot kiln and then we painted them with a ceramic glaze before cooking them one more time. They really look quick special and the students are excited to take them home to play with some more. As part of our Reading Art Unit we have been looking at book illustrations and how characters are portrayed. 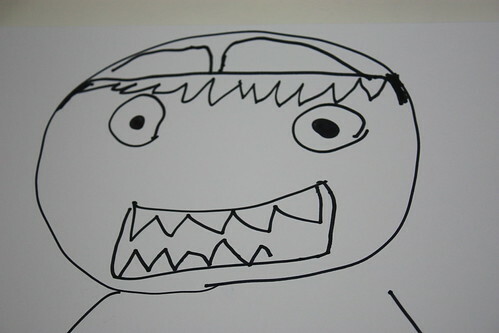 To help them understand how your face changes when you have different feeling some students practiced their cartoon drawings on whiteboards whilst looking in the mirror and others spent time acting for each other and drawing each other to capture what it looks like when you are angry, sad, shocked etc. We created frames for the students to draw their characters in. 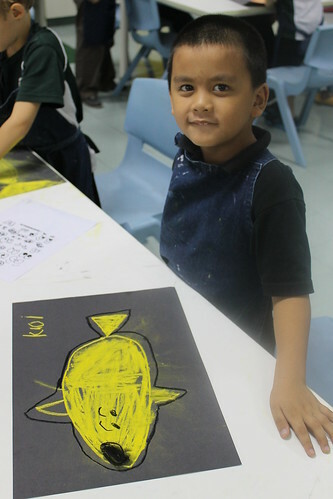 Having a frame makes your artwork very special and is an easy thing to do at home to get you and your kids drawing.From their observations, experiences and from looking at each other and themselves, they created some very cool cartoon characters. There characters showed a range of emotions. Have a look outside the ES office for the display of this work. Dr Suess Fish with feelings! 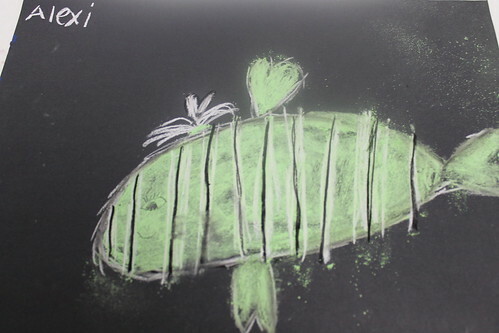 As part of our Reading Art Unit Grade 1 students looked at the characters in the Dr Suess book 1 Fish 2 Fish. They understood that the feelings of the fishy characters changed and that this showed in their body language and facial expressions, particularly their eyes. Can you see what kinds of feeling our fish have? Grade one classes Montilla and Laing have been getting to know each other and I have been getting to know them. They used markers tissue paper, and watercolor to create these portraits. They wanted to show how they see themselves. They are certainly bright and interesting people in grade one and I am looking forward to sharing many creative lessons with them. 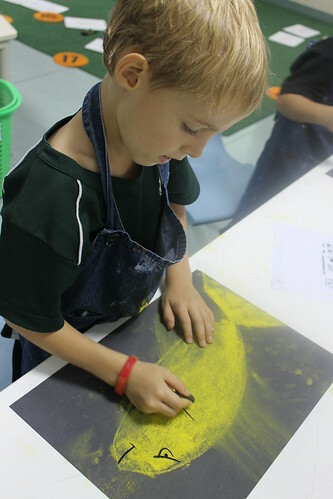 Grade 1 students explored lines, textures and colours in order to create compositions which where personal to them. Stamps, rollers, sponges and texture pads where used and children where very thoughful about how they used them to create symmetry and/ or balance in their work. It is really great to see how much they have grown this year and how purposeful they are with the choices they make when creating their art. Grade 1 have started a new unit and are inquiring into the question What is meaningful and personal to you as an artist? We began by exploring doodles. We discussed the line family and the importance of the line family because if you use these lines you can create any type of shape you want. Focused line work encourages children to focus on observations and improves hand eye coordination and fine motor control of pencils and markers. The children where challenging each other to “Do my Doodle?” it was certainly challenging as some of the doodles where very intricate! They even challenged Ms Hartley! In the photos above the students are trying to create as many different doodles as they can by using different combinations of the line family. Last quarter the children in Grade 1 were asking the question “How can we read art?” We shared some of the children’s favorite stories and talked about how the characters felt, making our own illustrations. We also spend some time with the children inventing there own stories. Firstly, they selected a page with a simple line or shape on it and then they had to continue the line or build on the shape to create a full page story. Another story telling activity involved choosing artwork by a famous artist that they thought would tell a good story. They working in pairs to decide if the artwork would be the beginning, middle or end of the story. They then continued the lines and shapes of the artwork to create another work which told the rest of the story in three parts and at the same time one piece of art. This work was also created with parents during the student led conferences. The children learnt that art can tell stories. They also appreciated that people read art in different ways and so one piece of art can tell a different story to each person who studies it. Child Hope is an organisation who work to educate and support children who live on the streets in Manila. The children they support come from two main areas of Manila; Divasoria and San Miguel. Child Hope volunteers take time to educate the children about what their rights are as children, how to protect themselves and where they can find help if they need it. About 4 times a year the children come to school to experience a fun day out. They go to the ES gym and play ball, they watch movies, they play games, they play on the playground and they do art. 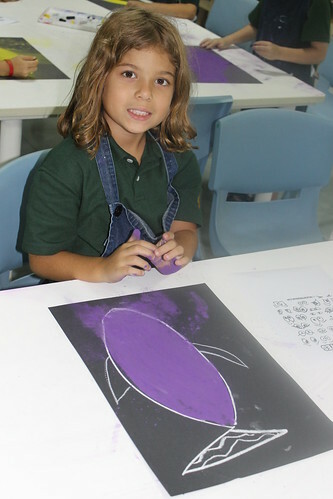 The children really enjoy the art activities as they do not have access to paper and pencils everyday like we do. They love to draw pictures, write letters to each other and make paper airplanes! I know we often talk about how lucky we are to have such amazing resources as we have at ISM but when I see these kids each year making joy out of simple things like paper, paint and pencils it really brings home to me how privileged be are. Thank you to everyone for coming to the ES Art Exhibtion this week. The children were so excited to have been able to share their learning with you. I really love to see the children in the exhibition talking about the work they have done during the year and also enjoying the work of other artists in the elementary school. The opening on Monday was a buzz of excitement with teachers, parents and students all sharing in the experience. Student Council were there as tour guides to the work of each grade level and did an excellent job of explaining the work and the process they went through to create it. Thanks for your feedback on the exhibition, which is always much appreciated. One point that came up was that children felt disapointed if their work was not shown. It is so hard to include some work by every single child, simply due to the lack of space. We always endevour to make the exhibition a showcase of the curricullum and the varied talents of the students. It is by no means, and is never intended to be, a talent show and so we try to incude work done by as much of a variety of students as possible. Sadly, the exhibition will come down on Monday, but feedback can still be sent via email or blog posts or via the Star Wall, which will be outside the ES office.